I will be the first to tell you that my kids don’t have a ton of toys. Sure, by global standards, they have so many. But compared to most kids I know, they have very few – and I keep getting rid of more. I especially can’t stand plastic crap and toys gender-marketed by throwing up pink all over everything that little girls are “supposed” to love. But, every so often, I come across a deal that’s too good to resist. That’s what happened here, so I decided to see what we could do and figured that if it didn’t work out, we could drop it off at Salvation Army. 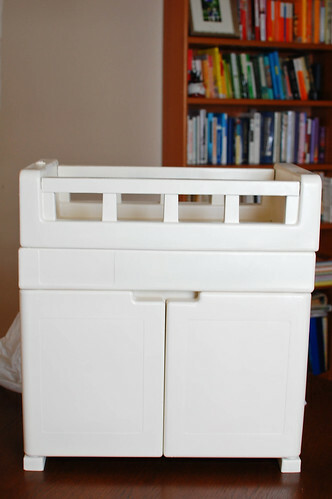 At a recent big consignment sale, I found this baby center – old and plastic, but it would serve a good purpose and it at least meets the criteria of being used if it’s going to be cheap plastic junk. 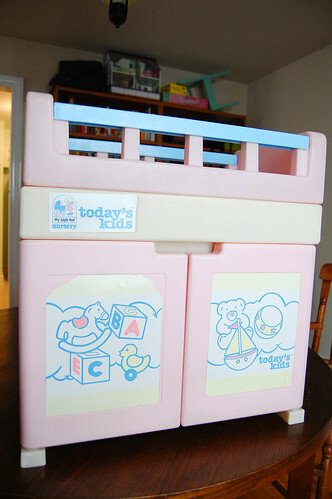 Weird stickers and random fading colors, but I knew the kids would love it, especially the part where the top comes off and there’s not only a changing table/crib for their babies, there’s also a bathtub! I remembered seeing a post somewhere about someone renewing outdoor toys with plastic paint, so I figured it was worth a shot. 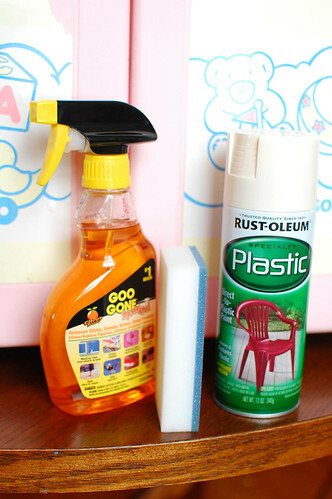 I headed to Home Depot and bought some spray paint for plastics, used some Goo Gone to get the stickers off, gave it a good cleaning with soap and water and a Magic Eraser for the tough spots, then we took turns spray painting a few coats when we had a minute. It took a few coats, but they dried quickly and evenly. Perfection? No. But definitely better looking since it will live in our main living space. Only time will tell how the paint actually holds up. Wow! That makes such a huge difference! Who knew you could paint plastic? P.S. – Your post title had me at ‘Before and After’. I am a sucker for before & after photos/stories! Wow, what a difference! I didn’t know you could paint over plastic like that. What a great way to renew something. I am sure your kids will love it. Thanks for this post! We recieved an old outdoor plastic Spring Horse. The paint is flaking off badly. I have wondered how to go about painting it. Your post is helping to get me motivated.